Alcohol is the most commonly used substance among older adults, and studies show dramatic increases in harmful alcohol use by this population. Providers must be aware of older adults' particular vulnerabilities to alcohol abuse. While the prevalence of alcohol use is generally lower among older adults compared with younger adults, aging is associated with physiological changes that may place individuals at high risk for adverse outcomes with alcohol use. For example, older adults experience a higher blood alcohol level and increased impairment given the same dose of alcohol compared with younger adults.5 Therefore, the National Institute on Alcohol Abuse and Alcoholism (NIAAA) has defined lower drinking guidelines for older adults. The NIAAA outlines that drinking more than three drinks on a given day or more than seven drinks in a week for adults aged 65 and older as being at risk for alcohol problems.6 A standard drink is defined as 12 ounces of regular beer, 5 ounces of wine, or 1.5 ounces of distilled spirits. • How often did you have a drink containing alcohol in the past year? • How many drinks containing alcohol did you have on a typical day when you were drinking in the past year? • How often did you have six or more drinks on one occasion in the past year? Alcohol screening instruments are readily accessible;18 however, they are underutilized.19 Several validated options exist for screening older adults and can be completed through different mechanisms including self-administration, provider administration, or online interactive tools. Factors that may influence selection of a screening tool can include considering the characteristics of a specific patient population, clinic structure, and time available. The overall benefits of using a validated screening tool are thought to outweigh the burden. The Diagnostic and Statistical Manual of Mental Disorders, 5th Edition (DSM-5), which was released in May 2013, defined AUD.20 DSM-5 no longer uses the terms alcohol abuse and dependence, which previously defined AUDs in the DSM-IV. Under the DSM-5, AUD is defined for any adult regardless of age who meets any two of 11 criteria during the same 12-month period. The 11 criteria described in the DSM-5 are structured as a series of questions regarding alcohol-related experiences in the past year. AUD is further subdivided into mild, moderate, and severe subclassifications, based on the number of criteria present. Of note, the DSM-5 criteria do not correlate with questions specific to quantification of alcohol intake as addressed by the validated screening tools discussed above. Physiologic and social factors unique to older adults may present unique challenges for making an accurate diagnosis using the DSM-5 criteria. Many of the 11 DSM-5 criteria may not be relevant for older adults or may be experienced differently. For example, with the criteria "Found that drinking—or being sick from drinking—often interfered with taking care of your home or family? Or caused job troubles? Or school problems?" these role obligations may not exist for older adults in the same way as younger adults. For the criteria, "Continued to drink even though it was making you feel depressed or anxious or adding to another health problem? Or after having had a memory blackout?" older adults may not realize the problems they experience are from drinking and may attribute them to social problems, chronic diseases, or medications. For another example, "Had to drink much more than you once did to get the effect you want? Or found that your usual number of drinks had much less effect than before?" due to physiological changes, older adults may have increased sensitivity to alcohol and therefore seem to have lowered rather than increased tolerance. Therefore, careful consideration of an older adult's current function and everyday activities needs to be assessed when applying the DSM-5 criteria. Alcohol history is customarily addressed with screening questions during social history. While social history remains a reasonable setting during which to ask about alcohol, focusing on other social concerns as a prompt for reflecting on alcohol use may help show a clinician's intent as being directed toward a patient's welfare. Risk factors related to alcohol use in late life include bereavement, unexpected or forced retirement, social isolation, and transitions in care/living situations. Caregiving for a chronically ill or terminally ill spouse may also increase stress and vulnerability to substance use.22 In-depth discussion about one of these other social concerns may fluidly transition into an alcohol discussion. Another potential method for sensitively connecting with patients on alcohol use may be to ask about use in the context of reviewing medical history and medications. Such opportunities include discussing alcohol use with patients who have specific conditions that may be worsened by alcohol use, such as liver disease, gastritis, hypertension, gout, insomnia, depression, or recurrent falls.22 There is a high prevalence of alcohol-medication interactions in older adults ranging from 19% to 38%, depending on the study and setting.23 Medication interactions with alcohol can occur in older adults due to changes in absorption, distribution, and metabolism of alcohol. The types of risks depend on the amount of alcohol and type of medication but can include increased blood alcohol levels, disulframlike reactions, and increased and/or decreased drug metabolism and/or effectiveness.23 This framework may be useful for introducing alcohol history in the context of medication history. Precise questions that quantify alcohol use are preferable to inquiring about a patient's interpretation of his or her own drinking pattern (for example, "Do you think you drink too much? ").24 Many older adults and families view alcohol as being their "one last pleasure," which complicates perspectives on the impact of alcohol consumption.10 Use of validated screening tools as described earlier provides a construct to ascertain at-risk drinking though a combination of quantification as well as the relation of drinking with behaviors, comorbid disease, and use of potentially problematic concurrent medications. A growing number of older adults engage in unhealthy alcohol use and may not be fully aware of the effects of alcohol as individuals age or of the potential risks of alcohol. 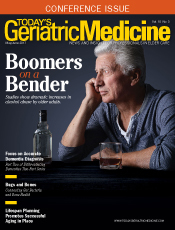 Geriatricians and primary care providers play a vital role in screening and identifying unhealthy alcohol use by older adults, which may be complex because older adults with alcohol use problems may not present with the same symptoms as younger adults. Several validated screening tools exist and are the preferred method for initially assessing problematic alcohol use. However, diagnostic criteria for AUD may present unique challenges in the geriatric population. Discussing alcohol can be a sensitive and difficult topic though strategies exist to help integrate alcohol questions into standard history taking, including history of the present illness, past medical history, medication history, and/or social history. The NIAAA provides multiple online resources for clinicians and patients describing ongoing research and providing resources on alcohol and its impact. — Roopali Gupta, MD, is an assistant professor and geriatrician at University of California, San Diego. — Benjamin H. Han, MD, MPH, is an assistant professor and geriatrician at New York University School of Medicine. — Alison A. Moore MD, MPH, is a professor of medicine and chief of geriatric medicine at University of California, San Diego. 1. Blazer DG, Wu LT. The epidemiology of alcohol use disorders and subthreshold dependence in a middle-aged and elderly community sample. Am J Geriatr Psychiatry. 2011;19(8):685-694. 2. Moore AA, Karno MP, Grella CE, et al. Alcohol, tobacco, and nonmedical drug use in older U.S. adults: data from the 2001/02 national epidemiologic survey of alcohol and related conditions. J Am Geriatr Soc. 2009;57(12):2275-2281. 3. Han B, Gfroerer JC, Colliver JD, Penne MA. Substance use disorder among older adults in the United States in 2020. Addiction. 2009;104(1):88-96. 4. Han BH, Moore AA, Sherman S, Keyes KM, Palamar JJ. Demographic trends of binge alcohol use and alcohol use disorders among older adults in the United States, 2005-2014. Drug Alcohol Depend. 2017;170:198-207. 5. Oslin DW. Alcohol use in late life: disability and comorbidity. J Geriatr Psychiatry Neurol. 2000;13(3):134-140. 6. Older adults. National Institute on Alcohol Abuse and Alcoholism website. https://www.niaaa.nih.gov/alcohol-health/special-populations-co-occurring-disorders/older-adults. Accessed March 1, 2017. 7. Thun MJ, Peto R, Lopez AD, et al. Alcohol consumption and mortality among middle-aged and elderly U.S. adults. N Engl J Med. 1997;337(24):1705-1714. 8. Moore AA, Endo JO, Carter MK. Is there a functional relationship between excessive drinking and functional impairment in older persons? J Am Geriatr Soc. 2003;51(1):44-49. 9. National Institute on Alcohol Abuse and Alcoholism. 10th Special Report to the U.S. Congress on Alcohol and Health. Bethesda, MD: National Institutes of Health; 2000. 10. Klein WC, Jess C. One last pleasure? Alcohol use among elderly people in nursing homes. Health Soc Work. 2002;27(3):193-203. 11. Kuerbis A, Sacco P, Blazer DG, Moore AA. Substance abuse among older adults. Clin Geriatr Med. 2014;30(3):629-654. 13. Saunders JB, Aasland OG, Babor TF, de la Fuente JR, Grant M. Development of the Alcohol Use Disorders Identification Test (AUDIT): WHO Collaborative Project on Early Detection of Persons with Harmful Alcohol Consumption—II. Addiction. 1993;88(6):791-804. 14. Bush K, Kivlahan DR, McDonell MB, Fihn SD, Bradley KA. The AUDIT alcohol consumption questions (AUDIT-C): an effective brief screening test for problem drinking. Ambulatory Care Quality Improvement Project (ACQUIP). Alcohol Use Disorders Identification Test. Arch Intern Med. 1998;158(16):1789-1795. 15. Smith PC, Schmidt SM, Allensworth-Davies D, Saitz R. Primary care validation of single-question alcohol screening test. J Gen Intern Med. 2009;24(7):783-788. 16. O'Connell H, Chin AV, Hamilton F, et al. A systemic review of the utility of self-report alcohol screening instruments in the elderly. Int J Geriatr Psychiatry. 2004;19(11):1074-1086. 17. Blow FC, Brower KJ, Schulenberg JE, Demo-Dananberg LM, Young JP, Beresford TP. The Michigan Alcohol Screening Test — Geriatric Version (MAST-G): a new elderly-specific screening instrument. Alcohol Clin Exp Res. 1992;16:372. 18. Moore AA, Beck JC, Babor TF, Hays RD, Reuben DB. Beyond alcoholism; identifying older, at-risk drinkers in primary care. J Stud Alcohol. 2002;63(3):316-324. 19. Friedmann PD, McCullough D, Chin MH, Saitz R. Screening and intervention for alcohol problems: a national survey of primary care physicians and psychiatrists. J Gen Intern Med. 2000;15(2):84-91. 20. American Psychiatric Association. Diagnostic and Statistical Manual of Mental Disorders. 5th ed. Arlington, VA: American Psychiatric Association; 2013. 22. Pachana NA, ed. Encyclopedia of Geropsychology. 1st ed. Singapore: Springer; 2015. 23. Moore AA, Whiteman EJ, Ward KT. Risks of combined alcohol/medication use in older adults. Am J Geriatr Pharmacother. 2007;5(1):64-74. 24. Sacco P, Kuerbis A. Older adults. In: Vaughn MG, Perron BE, eds. Social Work Practice in the Addictions. New York, NY: Springer; 2013:213-229.